Rice planting is a communal effort. The bamboo we planted at the beginning of the year has 3 new shoots growing at about 6 inches a day. The rice fields around us have been flooded for over a month now. The rice is sprouted by throwing the seed into one area then replanted. 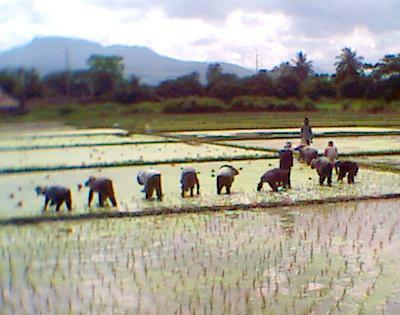 Rice planting is a communal effort. The group of people seen here each having their own fields, each helping others get planted out.